Short reviews of recently read books that have filled our days...and nights...with reading pleasure. Lia Kincaid, illegitimate daughter of the Duke of York, comes from a long line of notorious women. Raised by her grandmother, formerly mistress to the late Marquess of Lendale, she has little hope of a respectable marriage. But the new marquess, her childhood friend, Jack Easton, would make a very desirable protector . . . if he weren't too honorable to take her to bed. It's bad enough being saddled with a title he never desired. Now Jack must resist the beautiful woman he desires far too much. Duty calls, and he is duty-bound to choose a wealthy bride. But then Lia makes another outrageous suggestion: asking Jack to devise some tests to find her the perfect paramour. Tests that involve flirting, kissing, and other pleasurable pursuits. Tests that, in a matter of weeks, could transform friendship into the ton's greatest scandal, igniting a passion even duty can't deny. 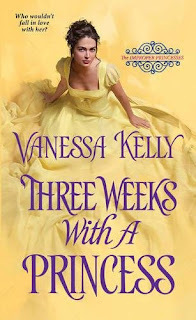 . .
Vanessa Kelly's Renegade Royals series includes some of my favorite historical romance stories of the past few years and the first two books of her new spin-off series, The Improper Princesses, have kicked the entertainment factor up even higher. I enjoy a good friends-to-lovers story, especially friends with a solid childhood history who are reunited as adults under challenging circumstances. After inheriting a title and nearly bankrupt estate he never wanted, Jack's mother is determined to find him a rich heiress and wants Lia and her grandmother thrown off the family estate while Jack is determined to protect and provide for them. Lia, who has always been a fixture on the estate (growing up in a cottage there with her grandmother) doesn't want to add to Jack's burden and sets off for London to provide for her family by following in her mother's footsteps on the stage or, as a last resort, as a courtesan. It is her family legacy, after all, even though sheltered Lia has never been exposed to it. Jack, of course, isn't about to let Lia shoulder the responsibility that should be his and travels to London to head her off. Jack is all about responsibility...not to mention guilt...and, of course, there's that pesky attraction to his childhood friend that is fast exploding into a blaze of desire. Of course, Lia leads him a merry chase at every turn. It's so much fun to watch him gradually realize his childhood friend is all grown up and what that fact is doing to his mind...not to mention, his heart. What follows is a fast-paced adventure that includes danger, desire, witty banter, exposed family secrets, humor, and heartwarming romance. Fans of Kelly's books will be delighted to see familiar characters from both her Renegade Royals and the first Improper Princesses book, My Fair Princess play key roles in this story while readers new to this world should be able to enjoy Jack's and Lia's journey without being lost. I highly recommend adding Three Weeks with a Princess to your summer beach bag along with the first book in the series, My Fair Princess. I thoroughly enjoyed both books and am hopeful that Lia and Gillian (heroine of My Fair Princess and, possibly, my favorite Vanessa Kelly heroine ever) will both appear again in future books. I haven't started this series yet but Vanessa is a favorite author of mine. I highly recommend it, MsAwesome! And, while it's not absolutely necessary to read the first two Improper Princesses in order I think it will greatly enhance your enjoyment if you do. Sounds delightful. I will be looking for this one. I enjoy her books. PJ, thank you so much!! I'm truly thrilled you enjoyed Lia and Jack's story!